The Social Media tool has undergone several advantageous updates. These will provide stable and efficient analysis. Check them out! First of all, meet the new ‘Facebook’ section. It contains three new reports: ‘Engagement’, ‘Audience’, and ‘Activity’. Most of the data from these reports has already been available before. However, the old reporting structure wasn’t convenient enough, since different social channels provide different types of data, and sometimes it’s really difficult to get a good representation of all social channels using only one report. That's why we’ve decided to move toward new stand-alone sections. Let’s take a look at the ‘Engagement’ report. It consists of 4 main sections. The top section consisting of 4 metrics provides a quick view on engagement level and its change. 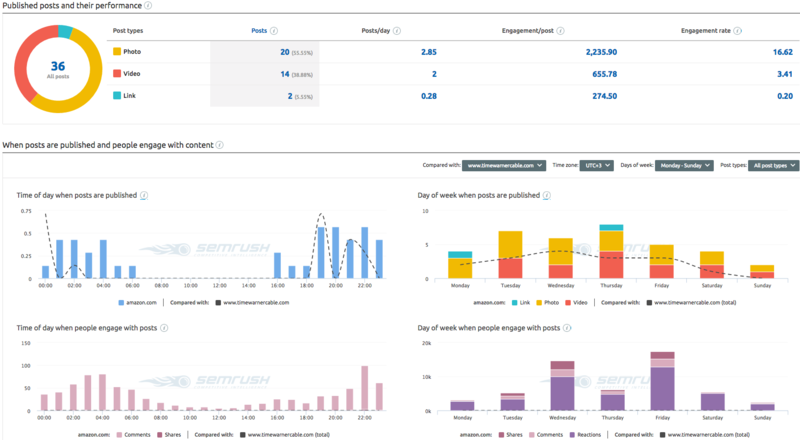 The second section – ‘Engagement summary’ shows you if there's a prevailing engagement type and to signal if there's a high engagement peak on some day. This section includes a table with likes, shares and comments distribution. The ‘Engagement trend compared to competitors’ section allows you to quickly identify your competitors’ high-engagement peaks. Hovering over a peak and clicking on it will show the content users are engaging with. This is very useful for finding the most engaging content that your competitors’ have posted, and studying it. The ‘Total engagement compared to competitors’ section allows you to compare all your competitors’ total engagement, as well as their likes, shares, and comments – very convenient for checking who's ahead. The ‘Audience’ report shows overall data about Facebook page likes at the top section. The ‘Page likes trend’ chart is to show the number of total Facebook page likes changed over the selected time period. Changes in both activity and engagement can be mapped on audience trend. The ‘Where are this page’s fans from’ chart, as the name suggests, shows how the fans of this Facebook page are distributed by countries. 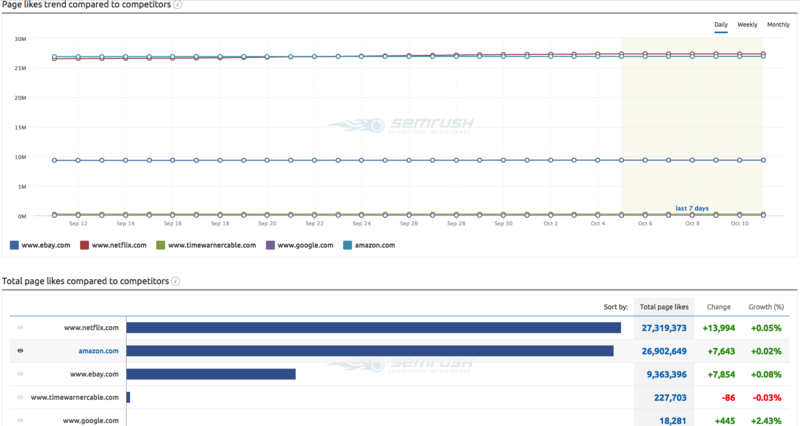 The last two comparative charts allow users to compare their audience with their rivals. 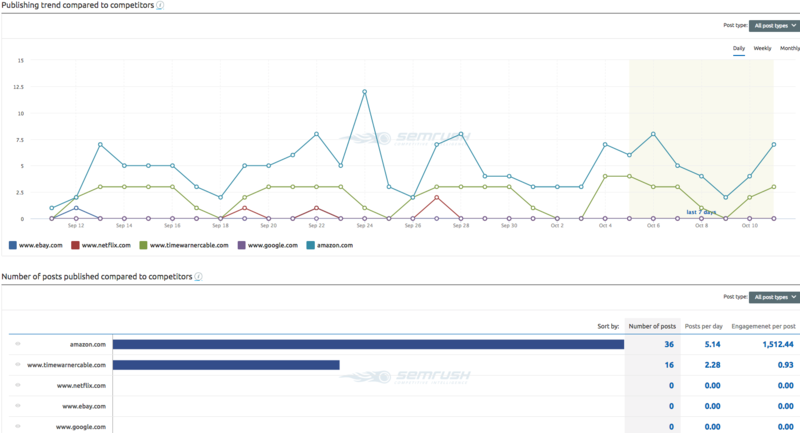 The top section of the ‘Activity’ report contains overall data on posts published by a particular company. The next three charts deal with your published posts performance and users’ engagement with content. And finally, there are two graphs for comparing the results of your social activity to your rivals'. More Social Media tool updates are ahead. Stay tuned and don’t forget to send us your comments and suggestions at [email protected].